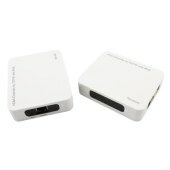 of 1080p/60Hz up to 330 feet (100 meters) away from your HDMI or DVI-D source by using one CAT5e/6 cable. Meanwhile,this product supports the Command forwarding function of infrared remote control (IR forwarding function). to many video and audio transmission function that a sender of this product can support multiple Receivers. M-JPEG encode/decode video up to 1080p. Support the command forwarding function of infrared remote control (IR forwarding function). Support resolution up to 480p/720p/1080i/1080p. Support max video bandwidth to 1.65Gbps/165MHz. Support one to many video and audio transmission function that a sender of this product can support multiple Receivers. 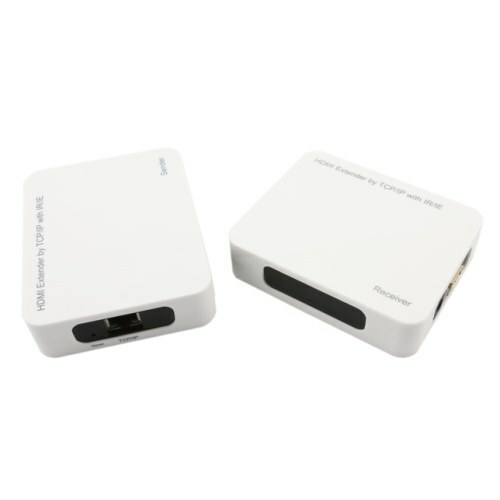 Note: Only when Sender and Receiver are directly connected through the LAN Cable , the IR forwarding function can be used. If sender and Receiver establish data link through a network switch or a router, the IR forwarding function will not be used. Connect HDMI Source to this Port. Connect the Sender to the Receiver or Ethernet router or hub by using a Cat5e/6 cable. Use a pin or a pointed object to insert into the hole of reset, press more than 5 seconds, then the MAC and IP of sender can be restored to the factory setting. Use a pin or a pointed object to insert into the hole of reset, press more than 5 seconds, then the MAC and IP of receiver can be restored to the factory setting. Connect the Receiver to the Sender or Ethernet router or hub by using a Cat5e/6 cable. Connect HDMI sink device to this Port.